DELIGHTFUL MOM STUFF: Sunday Recap: Izzy's 4th Birthday Party! Well, we have completed our 5th Princess Party in our family- I must admit- I am sick of princesses! 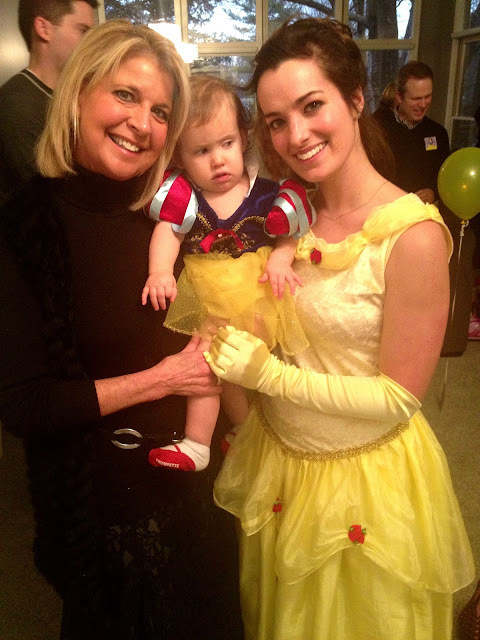 :) But...with 3 girls- they are not going anywhere- so Princess Party #5 happened last night! We did "Princess at My Party" again (see our Ariel Party HERE) Izzy has been dreaming about her Princess party since Ellie had one last year. She even followed "Repunzel" out the door at a friends party and made sure she knew to come over on January 15 for her birthday! SO.. we did the Belle party! I was determined to not use any "Disney Princess" marketing materials- just a yellow party in honor of Belle! (we did do 1 large princess balloon at Izzy's request!). SO...Here you go- Izzy's 4th birthday! There you go- a complete recap! Tuesday is the big day- so I am sure we will have many parties to come! Jenica, Izzy's princess party was phenomenal! It looks like Izzy really enjoyed her special birthday! The girl who played Belle looked just like Belle! :-) I am going to use your Mason jar glass idea - I love that! When you found out Millie was a girl I texted Dave that one of them was bound to be a soccer player - maybe Millie will have a soccer party. :) I'll keep my fingers crossed. What fun, glad she had a good birthday! Love the mason jar lids, I am going to bookmark that page! Sooooo so fun! Love all of the details, jenica! Just precious! Happy birthday lil Izzy!